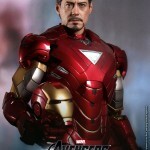 Hot Toys has released a photo of another Avengers Movie Iron Man figure. They previously revealed the Iron Man Mark VI Joint Promo Edition. 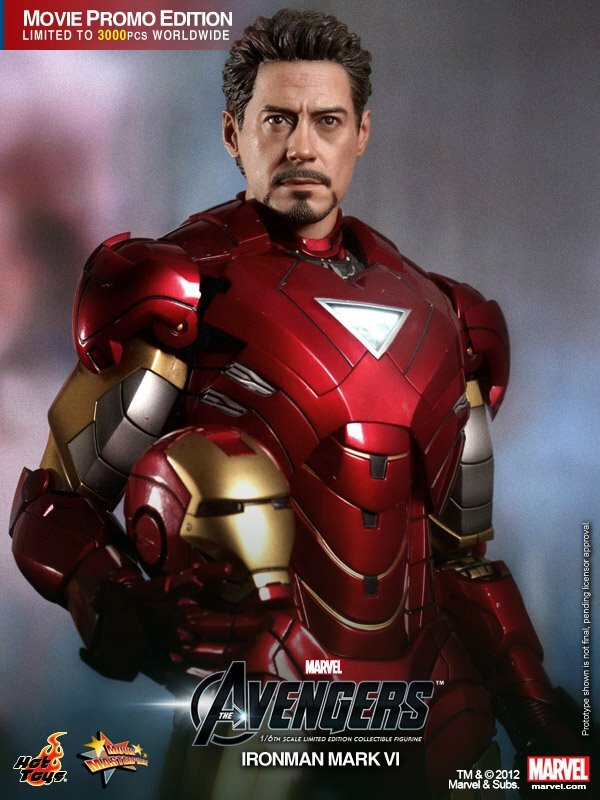 Now they have released a photo of the previously announced Iron Man Mark VI Movie Promo Edition. Looks fantastic! I don't have any of the Hot Toys IMs, what are those little accessories under the hands/helmet? I believe, though I'm not entirely sure, those are to display Iron Man with some of his "vents" open. I hate these freakin Hot Toys figures as I'll never be able to afford any of them. I have the original hot toys MKVI and they are tiny arm rockets. It's interchangeable pieces for his forearms. So you can either have a "arm-rockets-deployed" look, or a normal look. To be honest this MKVI doesn't even have the battle damaged pieces, or the flying base. If I was interested in hot toys MKVI, and didn't have one, I'd look to buy the first version. It'll cost you close to a $100 bucks more, but it's definately worth it if you collect hot toys. I really just want to see the Avengers versions of our heros. I will buy a 1/6th hulk to go with the marvel characters I already have...but I REALLY want to see what Hot Toys has in-store for the 1/4th Avengers line!!! Almost every hot toys Iron Man figure comes with 2 headsculpts, 6 pairs of hands, a neck piece to remove or add depending on the headsculpt you want displayed. Each figures has real moving flaps on the back, missles in the shoulders and arms. opening flaps on the legs, feet etc. Tons of goodies, This repaint looks awesome but pricey probably will be $3-400 range. Honestly Hot toys figures can be feasable, but it takes time and planning to save. If you spend $100+ a month on random cheaper figures, if you save for 2-3 months you'll have enough. I'm constantly amazed at their products and how good they are. They're all basically statues with articulation. High details and size from statue, yet with poseability of a figure. These should be standard all collectors should go by, if they weren't so pricey. - Hope you guys welcome me to ToyArk. I own the battle damaged Mark 3 and love the figure, If I had some serious bank roll, I would probably only collect Hot toys, but I don't, so I don't lol. I have the Iron Man 2 Mark VI and this looks to be the same exact figure except for the additional accessories and scuffed paint marks. So unless this is has some really cool new edition to it like the Mark II 2.0, it does not look worth purchasing if you already own a Mark VI. I would probably buy it if it had a really cool new feature or accessory over the first one. If you are a completionist though, then I guess you should pick it up.